Wow – considering how new the blog was (and how dirt-cheap TOT was at the time), I’m astonished I was so critical of management! But I’m sure I was also conscious of how limited my audience was back then… 😉 On the other hand, these comments nicely illustrate that I’ve had an activist perspective since day one. Now, with the share price so much higher, it’s that much more important to focus on management – their strategy & their failings. 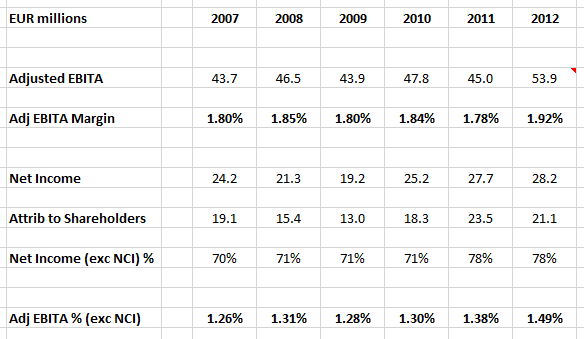 [Note: I’m also including 2006 segment results for reference. Plus TOT’s results for the Last Twelve Months (LTM), which incorporate their most recent interims – I’ll return to these a little later]. Since the de-merger, Total Produce has raised revenue by 51% in the past 6 years (albeit a significant portion of the increase came back in 2007). Adjusted EBITA’s their preferred measure of operating profitability – a cumulative 39% increase has lagged revenue, as their (fairly static) adj EBITA margin has averaged 1.83% since (versus 2.09% in 2006). Adjusted diluted EPS has clocked up the same increase, for a slow but steady 5.7% CAGR. It’s worth noting this comment from the interims: ‘Trading conditions are satisfactory and the Group is revising upwards its full year earnings target into the upper half of the range between 8.00 to 8.80 cent per share.’ With the current EPS run-rate already at EUR 8.38 cts, I think we can confidently expect at least 8.8 cts for FY 2013. That would mark two yrs of 10%+ earnings growth – which we haven’t seen since 2007. Wow, management spent over a quarter of a billion Euros on acquisitions & net capex! So, what did shareholders get in return? Well, revenue increased by nearly a cool billion! Sounds good, ’til you realize (all other things being equal) it cost EUR 251 million (mio/m) to buy/enable/deliver EUR 950 mio of sales. Effectively, that’s a Price/Sales (P/S) ratio of 0.26 – by comparison, TOT currently trades on a 0.09 P/S (and a miniscule 0.05 P/S two years ago!). Aah, but aren’t we forgetting all the cost-savings & synergies those revenues provided? Er yes, if we could bloody well find them…an adj EBITA margin of 1.92% in 2012 is barely higher than the 1.83% long-term average. But still, adj EBITA’s up 39% since 2006, so that’s an incremental EUR 15.1 m of annual EBITA we can hope to earn from this cumulative investment. Except that’s a 6.0% annual return on investment. And slap on an interest & tax charge, the net return on investment can barely hope to reach 4.0% pa! Now some might quibble with the impact of timing & benefits, and what to include/exclude from this exercise. OK, if we focused on a single year or two, that could throw up big differences – but 6 years leaves nowhere to hide. Anyway, how much difference would it make – the figures might even get worse!? Some might also demand a more sophisticated financial analysis – but how much extra insight would you really gain, versus relying on a calculator & the back of an envelope? The only valid adjustment that occurs to me is the exclusion of maintenance capex. We don’t have those figures – let’s use the 2007 depreciation charge (of EUR 13.7 mio) as a proxy. This reduces cumulative investment spend to EUR 169 m, but only drags net return on investment up to 5.7% pa. That doesn’t set my heart aflutter, no matter how much I play around with the numbers – how about you..?! Meanwhile, over the same period, management only bought back a single block of shares – worth a grand total of EUR 8.6 mio – a mere 3% of their spend on capex & acquisitions! As was the ridiculous de-merger into three companies. I mean, what’s better than one empire – well, duh, it’s three empires! As was the notion an online fruit & veg portal would utterly transform the valuation of Fyffes, and even the fruit & veg market itself. [OK, maybe I’ll give ’em a free pass on this – investors were just as wild-eyed at the prospect!] As is the presence of EUR 89 mio of cash on the balance sheet, plus EUR 11 m of investment property & unlisted securities – all of which appear surplus to requirements. Now, if you’re easily spooked, this may all appear quite alarming. This promiscuous use of shareholders’ cash (plus debt) to fund expansion at all costs, and regardless of return, smacks of a management team severely lacking in judgement. It’s also reminiscent of those buggy-whip companies who spend ever-increasing amounts of money trying to escape their fate by boosting sales & lowering unit costs – which usually doesn’t work out so well for shareholders. While management piss away money on poor capital allocation choices, the business itself just keeps humming along. And regardless of their faults – if something ever goes unexpectedly & horribly wrong, I expect management would turn off the money spigot, roll up their sleeves, restore margins & earn their way out of trouble. So that should protect your downside nicely. And there’s big upside here too, Total Produce is an activist’s dream – in fact, it might just be the perfect candidate for a private equity bid. I think regular investors often under-estimate the potential of dull & dependable companies, but private equity investors don’t: They can (relatively) safely leverage up the business, focus on expanding margins, squeeze higher cash flows out of the business, regularly extract equity capital, and sell the business when public market appetite’s at its best. They really only focus on driving organic sales growth if it offers a high probability of superior returns & economies of scale. And similarly, they only pursue consolidation opportunities if it offers tangible & immediate cost-savings & revenue synergies. Of course, public company management can utilize a rigorous capital allocation process to implement a similar (private equity) approach. Even with very modest sales growth, a dedicated focus on margins, cash flow, and frequent & substantial returns of capital (via buybacks & tenders), will almost invariably produce superior long-term shareholder returns. Of course, this presumes management has a keen sense of intrinsic value – thereby ensuring capital’s returned in a value-enhancing (rather than a value-destroying) manner. Now, I’m not suggesting this upside (or downside) will suddenly materialize tomorrow. Total Produce obviously has some well-respected investors on its share register, but none strike me as particularly activist – in private, let alone in public. Private equity funds, on the other hand, have tens of billions in dry powder available. But I haven’t heard a whisper of PE interest in TOT, and they may end up very distracted by a trillion dollars of distressed debt across Europe. But if we arrive at a fair valuation based on current financials, and invest accordingly, there’s potentially a significant & asymmetric risk/reward attached to such an investment. And I love owning cheap businesses/assets which have free & potentially valuable option(s) attached. TOT basically reports net operating cash in the US manner, i.e. after tax & net interest paid. Let’s add them back to calculate adjusted (i.e. normal) net operating cash flow (Op CF), and deduct net PPE to arrive at operating free cash flow (Op FCF). I’m delighted to see operating FCF/adj EBITA remains pretty stable on a yearly basis & averages 96% over the entire period. [Again, this is exactly the kind of cash flow profile PE investors love to see..!] So a P/S valuation based on the adj EBITA margin looks entirely reasonable. However, TOT has significant non-controlling interests (NCI) in its subsidiaries – we must adjust accordingly. While this reduces the effective margin for shareholders, it’s encouraging to see the underlying adj EBITA (exc. NCI) margin has been slowly & steadily increasing to 1.49%. Using my normal rule of thumb (a 10-12.5% operating margin generally corresponds with a 1.0 P/S), I’ll continue to apply a fair value 0.125 Price/Sales ratio. The problem may actually lie in another disastrous aspect of management’s acquisition policy – the general avoidance of outright purchases (as per my examples above). Leaving substantial equity (20-30%+) in the hands of sellers might feel warm & fuzzy, but it’s no way to execute an acquisition. Even Buffett, who’s usually the warmest & fuzziest of investors & bosses, invariably purchases companies in their entirety. Because anything less than total control can quickly become a cultural, legal & tax road-block to realizing intended acquisition benefits. Anyway, there’s plenty of other ways to incentivize owners/management to stay on in a business (for an appropriate bedding-down period)]. 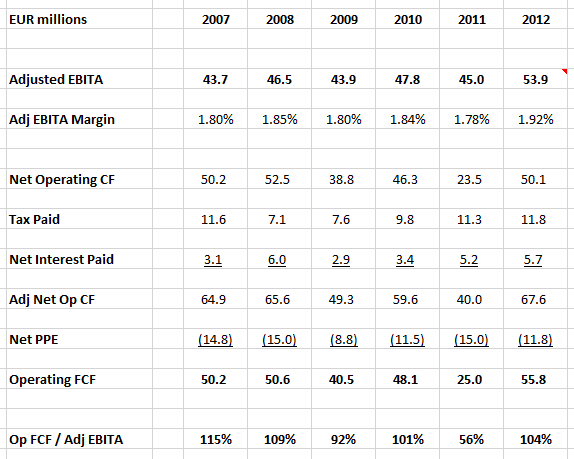 However, I’m now firmly convinced that P/S valuation (& the company) can support the current gross debt load. 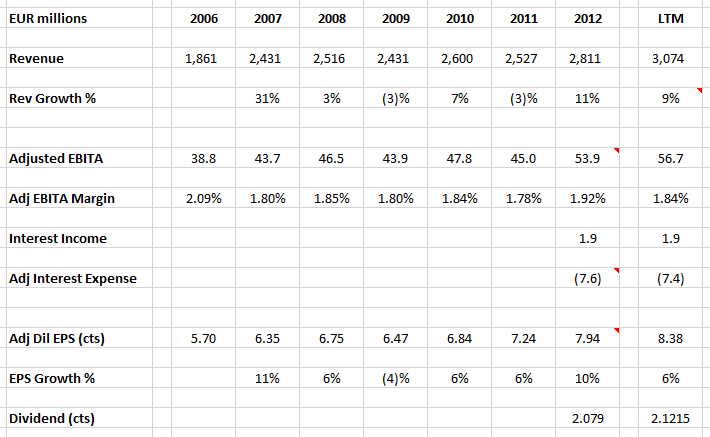 Reference my summary financials table again (above): I estimate the current run-rate for adjusted interest expense (exc. unwinding of discounts expense) is EUR 7.4 million, while adj EBITA stands at EUR 56.7 mio. This puts adj interest expense/adj EBITA at 13.1% (or 7.6 times interest coverage) – I’m comfortable with this ratio up to 12.5%-15%, particularly if it’s a stable business. [And it’s worth remembering gross debt’s only EUR 163 m – with 2012 operating CF & operating FCF at EUR 68 m & EUR 56 m respectively, any necessary debt pay-down should prove a doddle. Incidentally, TOT’s net pension deficit’s a very manageable EUR 27 m]. Obviously, this implies current cash, investment property & unlisted securities of EUR 99.7 m should be available to shareholders, free & clear – we’ll include it in our valuation. At the current share price, this would ideally fund the best acquisition management could possibly make – Total Produce itself! That is, a return of capital via share tender and/or a buyback programme – both value-enhancing & tax efficient. [Now, this may seem a colossal jump from my original EUR 0.882 price target, but that was two years ago – TOT’s financials have improved since, the earnings growth rate’s increased, and its cash pile is now surplus to requirements. And don’t forget I’ve revised my target along the way – most recently in April, to EUR 0.99. btw I was very interested to see Daniel Gladis, of Vltava Fund, present Total Produce as a single stock idea recently – he wrapped up by indicating EUR 1.10 as a (pretty similar) price target]. The EUR 0.83-0.88 price range is key life-time resistance, and the share price has been treading water just below that range for the past month & a half. A decisive break of this resistance zone opens up clear blue sky – with no remaining price anchors for investors to reference, that could imply an accelerated & more volatile share price trajectory. I now have a 5.9% portfolio holding in Total Produce. Management here are way more prudent than you can ever believe but it has served the company very well post demerger. I really do think that you are being a tad harsh on some of your views against management. They have always kept new acquisitions on the hook with a vested interest hence the recurring minority interest. IFRS Accounting standards I believe are skewing some of your numbers with regards to the cost of these acquisitions and the subsequent returns of same. They are obliged to book the acquisition at the TOP END of final earnout numbers from day 1 of acquisition which I believe is why you are seeing such poor returns in your numbers for new acquisitions. I for one believe management are confident that they can secure a higher return from these acquisitions than a share buyback at current levels, it just might take 2 years or so for the numbers to wash through. I also think you need to look slightly away from the financials for some answers to the significant uplift in earnings since 2012. In 2011 the company suffered a significant impairment to earning due to the very harsh weather across Europe, in an industry operating on wafer thin margins this can have a significant impact. Following on from this was the cucumber scare across Europe in 2012 and once again earnings were drastically impaired. 2012 was the first year in some time that we see unencumbered earnings and 2013 benefited from full year earnings across new acquisitions, I would fully expect to see the current acquisitions having a positive impact in the current year. Europe is a very mature market and acquisition prospects are limited so it is either a case of casting the net further afield or consider share buybacks at the current SP. Well, I’m sure a lot of annual performance reports are far harsher – I simply wrote ‘Good employee, v dependable – but definitely capable of delivering far better performance’. Management would love us to forget they ultimately work for us. The fact the McCann family owns a decent stake here doesn’t change that a jot – and external investors have a far larger stake. I welcome prudence, but get suspicious when it’s cited – all too often, it’s simply to justify the status quo. – Six years is long enough to see a substantial acquisition benefits – I don’t see them. – If I exclude 2011-12 spending (on the basis it’s only starting to deliver now), it’s only fair to include 2005-06 spending instead! Will that present acquisitions & returns in a whole new light? I doubt it. – We’re debating angels here anyway – no matter how rosy a perspective we take re their acquisitions, it can’t beat buying a business priced at a 0.05 Price/Sales! That was TOT’s valuation for most of the last 5 years. I agree there appears to be a step-up in the earnings growth since 2012 – long may it continue! Ultimately, we are both bullish shareholders here – but like I said, in terms of actual & potential performance, Total Produce is ‘definitely capable of delivering far better performance’. I liked your analysis. As you might know I have sold the shares. With a large share of minorities, it is not without risk to assume that any consolidated number (EBITA, cash) etc is really fully available for shareholders. Clearly, the company is on the hook for the debt, but do you really know whwere in the group the cash is sitting ? In such cases, I calculate after minority adjustements for any positive cash flow line (operating etc. )´but assume the debt and interest expense etc. has to be borne by the ultimate shareholder. This decreases the valuation by around -25%. In my opinion, considering the minority share, Total Produce is fairly valued. Actually, I think I must have missed your TOT post back in March – I was just reading it now, and I am struck by the fact you reach many of the same conclusions** – particularly your dubiety over the whole acquisition focus & scale/quality of the resulting returns. You make good points re minorities, but I think TOT & my valuation present less risk than normal in this regard. You’ll note I really only used the cash flow statement to confirm adjusted EBITA was an appropriate profitability measure to rely on (it is). I then haircut adjusted EBITA according to the minority interests, before calculating my Price/Sales valuation. And obviously this exclusion of minorities is automatic with my P/E valuation. The only departure in my analysis was when I looked at TOT’s debt service ratio – i.e. adj interest expense / adj EBITA – I used the full adj EBITA figure. But I think that’s appropriate – I’m evaluating financial risk at this point, so I consider debt service (& the banks) will always have first priority, rather than what set of shareholders have a claim on what portion of EBITA. As regards the cash itself – yes, we can’t tell where it’s located. The majority of it could be down in part-owned subs, or it could be concentrated in 100% owned companies – I think the default/average assumption would be to presume approx. 25% might belong to minorities. But that’s a relatively small component of my valuation. Personally, I think ordinary shareholders have a claim on the vast majority of cash etc. – I can’t confirm that though – but it’s worth noting TOT owned a v similar EUR 97 million of cash & investment property back at the de-merger date. ** This happens quite often! The latest example is Van Lanschot, a value-oriented fund manager & I were discussing it the other day, so we were bemused to see your LANS post a day later..! We had noted the obvious parallels to KA:NA – if you haven’t already, you might find it useful to compare/analyze BINCK:NA. TOT:there clearly is now right or wrong with any valuation approach. For me the problem with TOT is mostly, that there is a really huge difference between “adjusted” profit per share numbers and finally comprehensive income. I actully looked at Binckbank as well. However I found Van Lanschott to fit better into my portfolio. I think that “discovering” the same shares is no coincidence. The universe of cheap and solid small caps is somehow shrinking. Yes, always irritating to deal with those kind of gaps in earnings figures… But I was encouraged to see how well the cash flow statement stacked up vs. adjusted EBITA. I have a feeling this supports my anti-acquisition stance – a simpler & more focused business might consistently out-perform on a cash flow basis. Not sure if it’s what what you meant – but when stocks present an apparently similar proposition, one might as well opt for the cheaper one (like Lanschot – hopefully tilting risk/reward more in your favour). All makes sense to me. Value probably too conservative but safe better than sorry. Hope management read this. What price would share be now if they used buy back approach more aggressively over past years? Pity. Still time but better opportunity lost. Cannot complain too much, easy be wise in hindsight. Share price moving up steadily which will probably continue unless tender offer or other catalyst causes a sharp leap higher. Stay aboard is the message for boring long term investors like me. Yes, this is an easy one to still hold even though it’s doubled in the past two years. I find it ironic the one share purchase the company’s done since it de-merged was at EUR 0.39 – the exact same price as my original write-up (except a year earlier)! And they had the same cash (EUR 89 mio) then as they do now, and of course there’s been a few acquisitions since – yes, imagine all those funds had been ploughed into TOT shares instead..?! ?